Egyptian Christians are frustrated by the slow pace of the cabinet committee tasked with granting church permits, and they are outraged at the situation in Upper Egypt, where extremist mobs have attacked many churches that have applied for permits, with the collusion of police who close the churches and even arrest the priests. 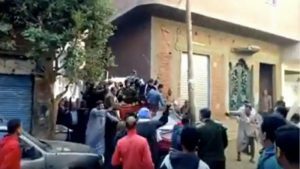 The image, a video still, shows a mob converging on a church building in Minya Governorate, 250 km south of Cairo, on 11 January 2019. For many decades, it has been extremely difficult for Egyptian Christians to obtain permission from the government to construct new buildings or repair existing ones, leaving many with no option but to meet for worship in unlicensed premises. In August 2016, the Egyptian parliament passed the Law for Building and Restoring Churches, intended to make it quicker and easier to obtain permission to construct and repair church buildings and to make provision for legalising the status of the thousands of unlicensed churches. The slowness of the committee has been widely criticised. By December 2018, of nearly 3,730 unlicensed churches that had applied for legalisation, the cabinet committee had registered only 508 and had granted only eight churches permits to build. A report issued by the Project on Middle East Democracy on 12 December 2018 points out that the granting of church building permits has actually slowed under the new law, stating that the eight building permits represent “an approval rate that is actually lower than what occurred under President Hosni Mubarak, who was widely criticised for dragging his feet on church permits”. The law provides that a church may be denied legalisation for security reasons, with provincial governors required to consider “the preservation of security and public order”. This gives grounds for refusal if local extremist Muslims put pressure on governors and threaten to attack, and thus the law entrenches discrimination against Christians. This has been evident in the many extremist attacks on members of applicant churches – some Christians have even had their homes stoned and burned. The Egyptian authorities closed four churches in villages in Minya in Upper Egypt within the last four and a half weeks. In each case, a Muslim mob gathered to protest against a church seeking legalisation and the police agreed to the mob’s demands and closed the church. At 1.30 pm on 11 January, following Friday noon prayers at the mosque, a mob of over one thousand extremists gathered to demonstrate against Mar Girgis Church in the Minya village of Manshiyet Zafarana,which is home to 1,000 Copts. Harassment against the church started on Coptic Orthodox Christmas Eve, 6 January, when Muslim protestors barged into the church building after a special service. The security forces asked the chanting mob to calm down and promised to remove the Christians and close the church, which is the only one in the village. They shuttered the building and forced out the two priests and the few members of the congregation who had been inside, to the accompaniment of shrieked obscenities from the mob, and then arrested the priests and brought them to the police station in a car usually used for carrying animals and rubbish. Video footage of the incident went viral on social media, but no action has been taken against the perpetrators. Similar incidents also occurred in the Minya villages of Abo Karkas on 11 January, Kafr el-Mansoura on 27 December and Kom Al-Raheb on 9 December, with mob protests leading to church closures. The recent wave of incidents, the police response and the lack of action against the perpetrators have caused great concern to Christians. The series of church closures coincides with President Sisi opening a new cathedral as a “gift” to Christians. While the cathedral was welcomed with joy, President Sisi was criticised for building it in a location where comparatively few Christians live – Nasr City, 40 km east of Cairo – rather than a location like Upper Egypt where a higher proportion of Christians live and where many have no legally recognised church building in which to meet for worship. Copts were angered when the Egyptian Cabinet issued a statement on 15 January denying that the security authorities had closed any churches in Minya. The statement said the Cabinet had contacted the Minya governorate to verify that churches had been closed indefinitely to appease demonstrators, but that the governorate’s reply was that such news was absolutely untrue and was no more than a rumour to ignite sectarian tensions and divisions. Outraged Coptic lawyers point out that in Minya’s Samalout municipal division alone, six churches remain closed after police shut them down on the pretext that allowing them to remain open would constitute a security hazard.